I hope you all had a great weekend. Mine was full of family and food...all great things. My sister came in to do a Dad/Daughter(s) weekend and we had a blast - despite the ridiculous amounts of food we consumed. Our family tends to plan the day around meals; it's actually pretty funny. But I have to say, we went to some great places and got to show my sister some new parts of SD. As mentioned on Friday, I finally got to wear my white lace shorts. I think I am still on a red, white and blue kick as that is what ultimately came together for our Friday night dinner. 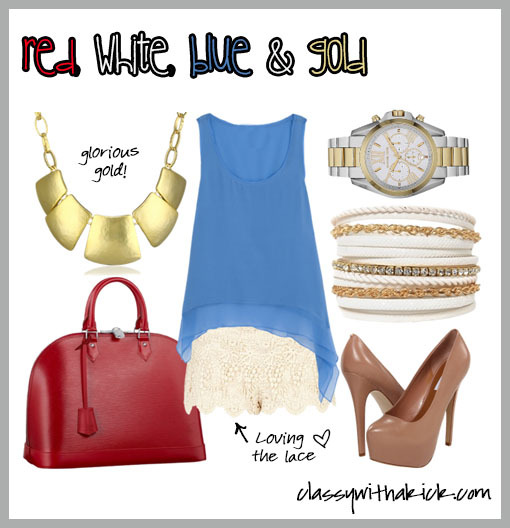 I added some fun gold accessories to add some gold and sparkle - and to make it look less 4th of Julyish. Saturday we hit up this awesome restaurant in Kensington to celebrate my Dad's belated birthday. Here is a pic of my sister and I at dinner. Don't we look alike?? I mean, it's almost like we are identical! Ha, ha! It's the Anchor Tank again!! Are you guys sick of it yet?? Sunday we spent some time oceanside at Georges in La Jolla. 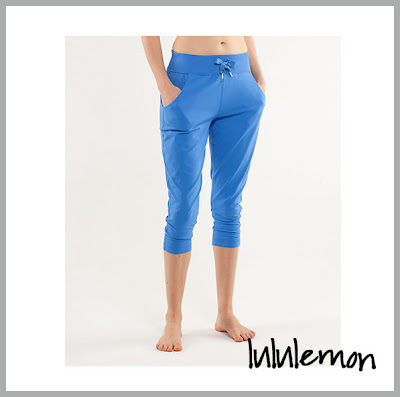 We went into Lululemon (of course) and I got these interesting pants - the Free Fall Crop. Not sure why I loved the dropped crotch, but I do. And they are super soft and comfy...love them! My new job starts today and I head to New York next week for an all company meeting and training. Super excited. All you NY readers...anything I HAVE to do while there? All comments/suggestions appreciated! Oh and if you have not noticed...I finally added Google Friend Connect to my blog so if you are a reader, please follow me! :) The link is up on the right hand side panel...I would LOVE more followers and I always follow back! Cute blog! Love the fashion!!! New follower from GFC hop! Love for you to stop by and return the follow. Hosting Like Me On Facebook tonight love for you to link up your page. Last week we had close to 200 pages. Hope to see you there.